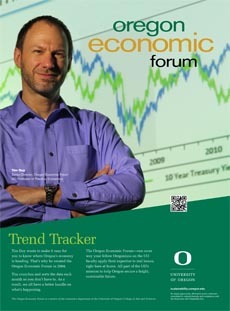 The University of Oregon Regional Economic Indexes for September 2017 was released today, November 20, 2017. We thank KeyBank for their generous support of this project. For all regions covered by this report, moving average measures (which smooth monthly volatility) remain above zero, indicating above trend activity. The Portland metro area looks to have lost some momentum in recent months, but watch for downward revisions of jobs numbers that reduces the reported strength in the first part of this year. This would suggest that for this cycle, Portland’s growth peaked in late 2015 and early 2016. Jobs numbers also boosted the Eugene-Springfield measures this year; revisions may reveal a somewhat more subdued pace of activity more consistent with that of 2016. Salem’s numbers have held consistently strong for almost two years. The pace of activity in Central Oregon appears to be moderating somewhat this year, but still indicates a healthy pace of activity. Note that some slowing in the pace of activity is expected as the economy is now in a more mature stage of the business cycle.